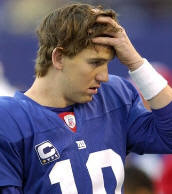 If you watched the "Manning Bowl" on Sunday night (Colts v. Giants, Game 2), you'll know that at halftime, poor Eli had only passed successfully for 17 yards while big brother Peyton had already passed for well over 100. At one point the score was 38-7 with Eli's Giants just being crushed by Peyton's Colts, and the game ended 38-14 (enough of a difference to make Peyton feel so badly that he declined his usual post-game interview). It was a sad weekend in the Klein household as well. 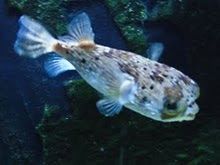 We had known for some time that the life expectancy of a blowfish was 5-10 years, and our own little Eli Manning the puffer was around seven (I say "around" as Max purchased him back in 2004 when Eli was at least one year old, making Eli at least seven and probably older). Eli's health had been on the decline for the last few months, and he had recently lost his vision. This meant we had to hand-feed him his krill, which just broke my heart because in his glory days, Eli just loved chasing after live fish for a yummy meal. I knew that it was only a matter of time, but that didn't make it any less painful when Max found me on Saturday evening and said that Eli had died : ( To most people, a fish hardly counts as a pet, and I actually agree for most types of fish. Our clownfish doesn't even have a name. We refer to him as "the clown." And as stated above, we fed other fish to Eli. Not to mention the fact that Max and I also eat fish, although I always felt guilty while cooking fish with Eli and Princess so close to the stove. Our little puffers, though, had little personalities! They would get super happy when they saw their food cup and start swimming excitedly, and Princess even squirts water at us to get our attention. When we moved Max from Palo Alto to Phoenix, Eli and Princess made the nine hour move in their little orange saltwater filled bucket (that Max had rigged with some water conditioner and a filter) because we couldn't bear the thought of giving them up. Then they of course made the 15 minute drive to our new house, so for as long as Max and I have been living together, we've had our "kids" in the house, too. To lose Eli was so very sad. Luckily I have a husband who is always so supportive and even agreed to hold a little burial in the backyard for Eli (this is when the .84 acre comes in handy).